BAE Systems | R.J. Kates Co.
BAE Systems is a global defense, aerospace and security company employing around 88,200 people worldwide. Their wide-ranging products and services cover air, land and naval forces, as well as advanced electronics, security, information technology, and support services. 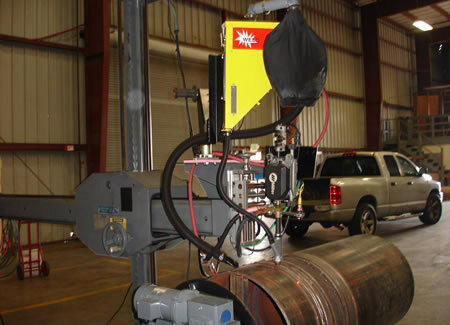 The following image is of a submerged-arc, fixed-automation, welding system that R.J. Kates built for BAE Systems’ San Diego Ship Repair to enable the rebuild of propeller shafts. Do you have a repetitive welding project that could benefit from a CNC Automation upgrade? Call us at R.J. Kates!